Note: Margaret Lowman served as Professor and Director of Environmental Initiatives at New College of Florida, CEO of The Marie Selby Botanical Gardens, (2003-2010) and Professor of Biology & Environmental Studies at Williams College. 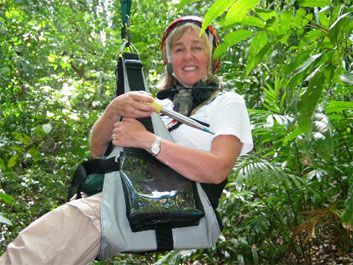 Margaret Lowman, of the New College of Florida, pioneered forest ecology by building the first canopy walkway in North America, in 1991. She recalls her adventures as a scientist and single parent in It’s a Jungle Up There. Why spend time in trees? Almost 50 percent of life on earth is estimated to live in tree canopies, yet this was an unexplored region until about 25 years ago. Much of my work has involved solving the challenge of just getting into the treetops: inventing gadgets, refining hot air balloon design, creating canopy walkways, working from cherry pickers and construction cranes. Once up there, I discovered that insects eat four times more leaf material than we imagined. Lots of things stress forests. And with forests becoming warmer, drier and more fragmented, insect outbreaks are predictably one of the first responses to climate change. A national science educators organization has named a New College faculty member 2019's Outstanding Undergraduate Science Teacher.